With parents beginning to make their spring break plan, the spring real estate selling season must be near. Once the children return to school following the break and trees leaf out, the season will be in full bloom. And from all indications, some of the inventory problem will be eliminated as new listings will sprout like flowers. For those lying in wait for homes, be not afraid of prices; they will only get worse – more expensive – in the fall. For those properties that survive the initial onslaught, the prices will fall in late June and hit bottom in early August, as a result of being either overpriced or flawed. The high number of terminated contracts continues to proliferate the marketplace as buyers are forced to make quick decisions with many buying based on Facetime tours. Among those buying and terminating is a common misconception that can have catastrophic financial repercussions. Upon making an offer on a property, the buyer should submit a check for earnest money, now often referred to as trust money. This is a deposit of sorts and, according to the contract, will be credited to the buyer at closing. With the barrage of contracts being terminated, it’s apparent that many buyers assume that the checks will not be deposited or “cashed” until closing. When the $10,000 earnest money check hits the account, it can cause checks to bounce, debit cards to be declined and all in the most embarrassing places and situations. In order for the buyer to abide by the stipulations in the contract, the earnest money must be deposited and clear the bank. Once the check clears, the buyer may terminate the contract, assuming those provisions are stated in the contract, and the earnest money will be refunded. Being the backwoods, hillbilly city that Nashville is, some would assume that the landscape would be cluttered with log cabins tucked into the mountainside and along the brooks and streams. That is, however, not the case, as there are few log structures in the Midstate area. The flammability of their key component, dried logs, could be part of the reason. Or it could be their isolated locales in the early years were out of timely reach of firefighters. Additionally, the structures are difficult to retrofit with electrical, insulation, air conditioning vents and other features that 20th and 21st Century houses include. It’s a rarity for log cabins to hit the market. And while most find the abodes interesting and wonderful for vacations and short stays, they do not fare as well when considered for permanent residency. Décor is an issue, as the walls in each and every room will look the same. Painting logs is not practical in most cases, and logs are usually dark by nature – even the lighter varieties. Art on the walls often fades into the background. 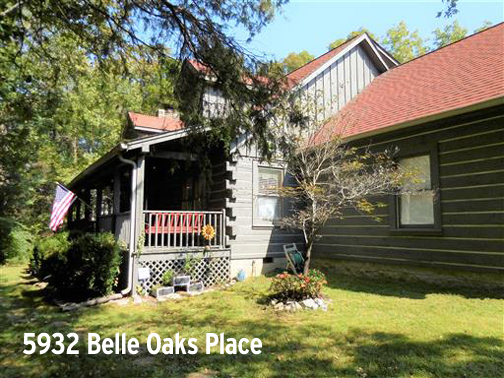 All of those issues aside, log homes are comfortable and warm, and the structure at 5932 Belle Oaks Drive boasts all of the characteristics that drive nature lovers into the woods. Realizing the challenge of the marketing and sale of the home, the sellers hired one of the most successful real estate brokers in the city, a visionary in her trade. Listing agent Debra Waters of Benchmark Realty in Franklin mentions that the cabin includes a real stone fireplace. Many faux log cabins have imitation everything, with even the logs sometimes looking as if they were molded plastic. This one is the real McCoy, and her challenge was to market to the entire area, even the Hatfields. Her remarks quickly shifted to the existence of a garage, a unique find in a home of this genre. In this neighborhood on the outskirts of Antioch, even the public schools conjure historic images. The elementary school is Thomas A. Edison, the middle school John F. Kennedy, while the high school is Antioch High. The Book of Acts states, “the disciples were first called Christians in Antioch” (Acts 11:26), and Saint Stephen of Antioch was one of the first martyrs of Christianity. Without Antioch, who knows Christ’s followers would be called, although Christians seems logical choice. While Saint Stephen and his group may have had some logs involved in the construction of their adobe abodes, they would have been surprised to see and entire structure of wood. Joseph, on the other hand, being a carpenter, would have flourished, but those were different times. Back in the Tennessee version of Antioch, Tara McGuire of Parks Realty needed to find her buyers a home soon, lest she become a martyr, and directed them to this heavily vegetated home tucked away in the solitude. The house was listed for $347,000, and McGuire performed a minor miracle by getting the price down to $308,500, which was no small feat for Waters as selling these homes can be excruciating.